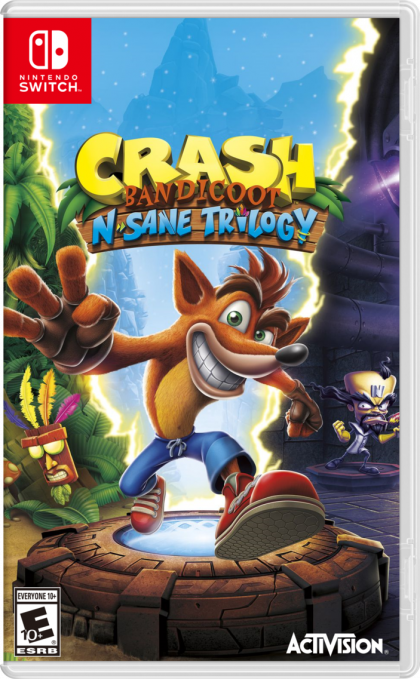 The Crash Bandicoot N.Sane Trilogy for Nintendo Switch adds two levels to the previously released trilogy: The legendary Stormy Ascent and the brand NEW Future Tense! Your favorite marsupial, Crash Bandicoot®, is back and he's enhanced, entranced & ready-to-dance! Now you can experience Crash Bandicoot like never before in fully-remastered HD graphical glory. Crash Bandicoot: Dr. Neo Cortex has a plan to take over the world, and he wants to create genetically engineered animals to do his bidding. Only you can help Crash save the animals, save his girlfriend, and foil Dr. Cortex's plot. Crash Bandicoot 2: Cortex Strikes Back: The evil Dr. Neo Cortex is back...out this time to save the world? And he's asking for help from his arch nemesis, Crash Bandicoot? Is this just a conniving plan to lure Crash into Cortex's next dastardly experiment? Can Crash win again or will he join Cortex's mindless zoo? Crash Bandicoot 3: Warped: It's a Whole New Time-Traveling Adventure! All new-style gameplay action - scuba dive, ride a motorcycle, a baby T-Rex, go free-roaming airborne in a plane, and more! More Action. More Fun. More Puzzles and Secret Levels. Are you ready to put more umph in your wump?